Imogen's Typewriter. 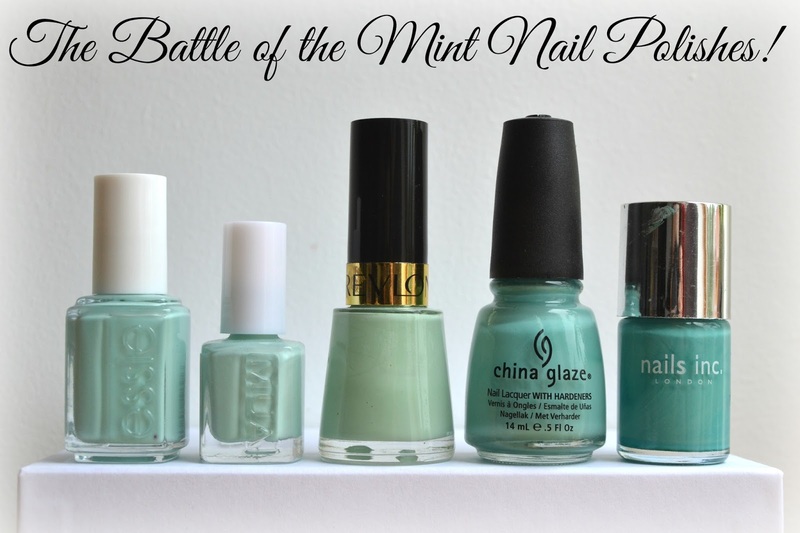 : The Battle of the Mint Nail Polishes! I actually didn’t know that I had so many mint coloured polishes, I originally was going to do a comparison of MUA and Essie as they are widely regarded as dupes, but instead this turned into a battle of the mint coloured polishes. I love my battles! This was two coats and it has a great thick brush good quality brush that the MUA polish falls short on. But it is a little streaky and goes on oddly. I can see why it's so popular though because the colour is gorgeous for spring/summer. However, it is way more expensive then the MUA colour at a pretty eye-watering price of £7.99 and Essie don’t appear to be cruelty free so I can’t, in good conscience, recommend this. This is 3 coats of a okay polish with a bit of a rubbish cheap brush that was a bit too thin. This was the only one that chipped with and without top coat within the three days I wore my little ombre look. But £1 and cruelty free! If you want Mint Candy Apple- just get this, it's only the tiniest bit lighter! Another disappointment which was surprising because Revlon do so many things well- and recently pulled out of China so yay, no animal testing. I did 2 coats and it is thick and opaque but it bubbles. Oh boy does it bubble. No matter if I shake, roll, leave the bottle for days, anything- it bubbles and takes an age to dry. It also cracks weirdly at the corners or any place my natural nail might bend throughout the day unlike any other nail polish I've ever tried. 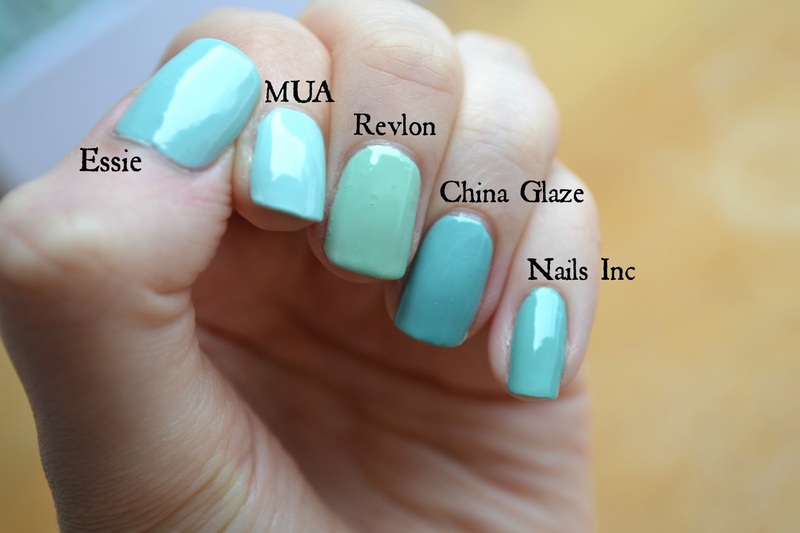 It is the only ‘true’ mint I have as well but BarryM have something similar that I might try next. I went with 3 coats to even this one out as it was quite thin but this helped it dry faster. It comes at a much nicer price tag and brush than the next guy! I really need more China Glaze in my life, they seem to be a really great brand. Here we have another 2 coats of streak. This one is slightly greener than For Audrey but to the extent of one stalk of grass being greener than the one next to it. If you're looking for that Tiffany blue then give this a miss and go straight to China Glaze. Overall it seems like mint polishes are very hard to do right! The MUA one was far more than you expect for £1, a good dupe for the Essie polish but more liable to chip, so save the extra seven quid if you have time to change your nail polish more often. Revlon bubbles on me every time which is a shame because the colour is gorgeous- a true mint green. China Glaze and Nails Inc offerings were both thin and they moved around if you went over where you already painted on the first coat but the colour- a dead dupe for Tiffany jewellery boxes and I slightly prefer China Glaze. Have you tried any of these polishes? What did you think?